049 – REPAINT and THIN NO MORE! 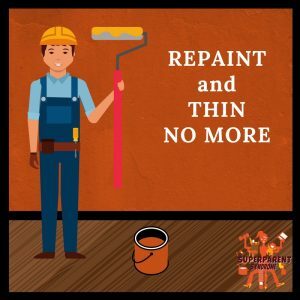 When I was in church, I remember one sermon in particular that was called “Repaint and Thin No More!” It was a play on words from the phrase, “Repent and sin no more.” And it’s an appropriate title for today’s podcast. For the last six years, we’ve been doing light touch ups to cover chips and dings on the walls. We had been using the same paint to touch up that we had originally bought. Recently, I hired two strapping lads to touch up the walls. Unfortunately, the paint didn’t get mixed well and it left very noticeable, leopard-like spots all over the walls. We would have to repaint the whole walls. It got me to thinking. Where else in our lives are we using proverbial band aids to cover up small problems? Where else are we just doing small touch up jobs to keep things going? Are we masking health issues with pain killers instead of changing our lifestyle? Patches only work so long before we have to take the time to tackle the whole problem. If the actual problem isn’t addressed, it can become something much bigger. Here’s my question. When are we doing to start? When are we going to repair or redo the roof or fix the leak? When are we going to take the time to work on our relationships? I like to make repairs when the sun is shining. I don’t like to repair the roof while it’s raining. It also made me look at my own life and where I’m making deposits? Am I doing the work now to develop a great relationship with my kids? Am I working out and eating right? Where in my own life do I need to stop re-patching and just need to put in the time to redo it and remodel? Here’s my challenge. Take ten minutes to think about your life and think about where you’ve been using patches? I recommend getting some help to do this. There are people out there who are able to help you, whether it’s a financial planner, a chiropractor, or a doctor. You may need these people because if you had seen it a long time ago you would have done it. Those people can help, they can help point out what needs to change and to develop a plan to grow from. Reach out and address the issue now, before it becomes a crisis. Please share your thoughts on my website and our newly launched Facebook page. Do you agree? Did you learn anything? Take a listen to today’s podcast. 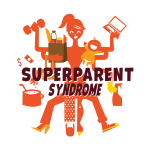 And as always, make sure to sign up for our show notes and links with our free newsletter at www.peptalksforparents.com and Weekly Peptalk Newsletter Sign-Up. 050 – Everyone Has Haters!